We apply the PSI5 mean-reversion algo to Dow 30 stocks in the weekly timeframe. 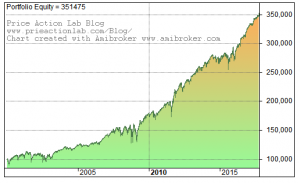 Since 2000 the strategy has outperformed S&P 500 total return on both absolute and risk-adjusted basis with and without a stop-loss. 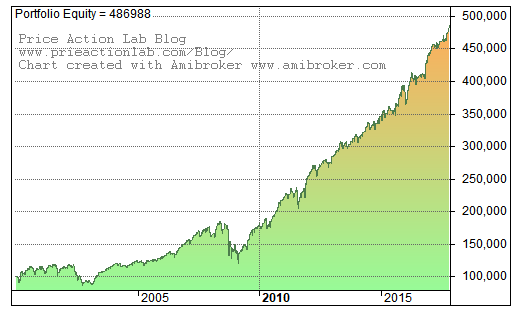 Weekly mean-reversion signals for Dow 30 stocks are included in Weekly Signals and in Weekly Market Analysis. With only one parameter adjustment in the PSI5 algo we use for daily mean-reversion with Dow 30 stocks we applied it in the weekly timeframe. 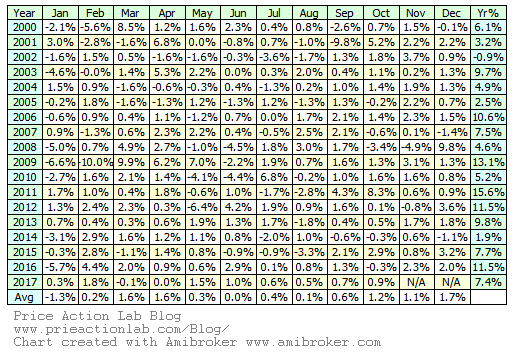 Below are the results for all 30 Dow stocks with a 2% stop-loss and without it. 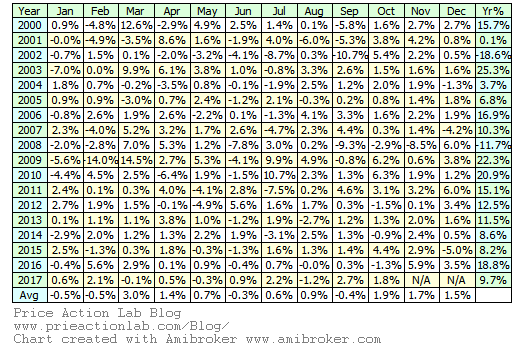 Note that the strategy without stop-loss was down 11.7% in 2008 and without stop-loss it was down 4.2%. 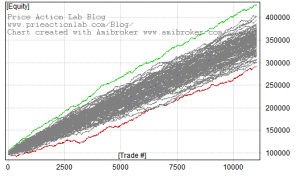 Drawdown can only be decreased without curve-fitting by switching to daily timeframe. 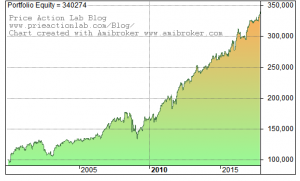 The daily strategy gained 4.6% in 2008. Below are the equity curve, monthly returns and Monte Carlo simulation for the weekly strategy without stop-loss. The probability of a drawdown greater than 14% is less than 1%. Below are the equity curve, monthly returns and Monte Carlo simulation for the weekly strategy with 2% stop-loss. 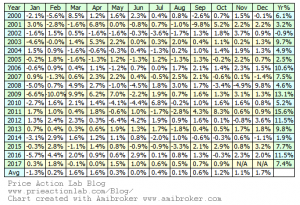 The probability of a drawdown greater than 13.5% is less than 1%. 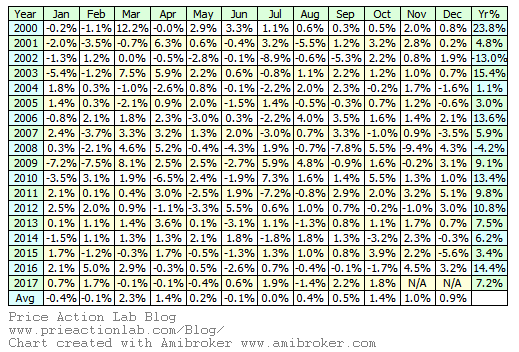 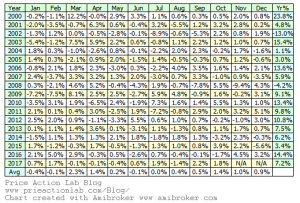 Below are the equity curve, monthly returns and Monte Carlo simulation for the daily strategy without stop-loss. 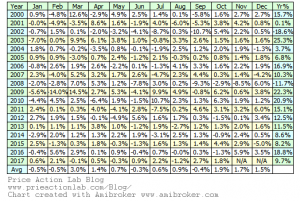 The probability of a drawdown greater than 7.5% is less than 1%. 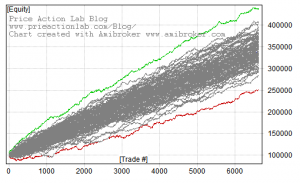 The signals of the weekly mean-reversion strategy are included in our Weekly Market Analysis. Click here for a sample report and weekly mean-reversion signals at the end.